Developing a bike sharing system has been one of the mobility priorities of the City of Tartu. A respective feasibility analysis was carried out in 2014 and a business model was developed based on the findings. The analysis showed that the potential number of bike share users in Tartu could be up to 224,000 people annually. The aim of setting up a public bike sharing system is to encourage the use of bicycles and make this a considerable alternative to cars. It is expected that the bike sharing system will bring about decreased environmental problems (noise, air quality), parking issues and problems with traffic intensity. Bike sharing is considered a part of the public transport system of the City of Tartu. As such, a bike sharing system of 450 bicycles and 65 parking locations will be set up as an additional mobility measure during the SmartEnCity project. The system will be designed as an electric bike sharing system and will be mainly targeted at people who need to travel ca. 2-5 km to work, school, home etc. 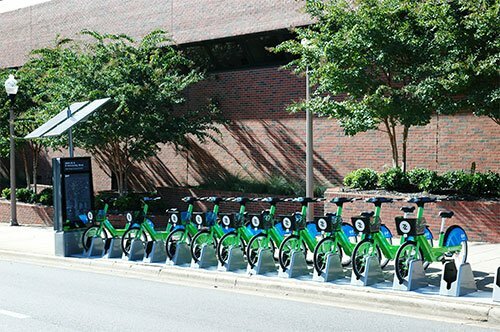 Broadly speaking, the bike sharing system will consist of public city bikes, parking lots with safety locks and a software system that enables to manage rides, rent out a bike in one of the parking locations and redock it in another. The service users will be identified through Tartu’s smart card (also used for other modes of transport) or mobile app. Visitors and tourists can join temporarily with their credit cards. The operator will collect information about the performance and use of the system for further planning purposes. The bike sharing system will be co-financed by the City of Tartu, national and private funds. No funding is requested from H2020. The bike sharing system will be operated by a private company, who will be selected through a public procurement. The residents of Tartu will be involved in the implementation of the bike sharing system already from the beginning of planning the solution and they have several roles in this process. First of all, the residents will be involved in deciding on the locations of the docking stations and drafting the service pricing policy (e.g. length of free driving time, daily and monthly pass prices). After setting up the bike sharing system, residents will be involved in improving the service quality. More specifically, questionnaires will be conducted to identify user expectations and needs, and the design of the service will be adjusted accordingly. Users need to make sure that they take care of the safety of themselves, others and the bike sharing equipment. Various bike sharing systems have been successfully set up in ca. 700 cities all over the world. In most of the cases, these systems have been established by large cities that have taken a strategic goal to increase the use of bikes and bring down the use of private cars. A considerable decrease in the cost of respective technologies has also brought cities closer to the point from which the implementation of bike sharing systems is attractive. However, as cities mostly set up bike sharing systems partly, e.g. in the central area or between major attractions, the comprehensive approach taken by Tartu to cover the entire city can serve as a good practice. After all, it is more likely that people will use the system if they can get to their exact destinations, not just the approximate neighborhood.